The preview of the latest CVS Ad also has a good range of beauty products. That includes makeup items, skin care products, ExtraBucks rewards, and more deals. CVS Weekly Ad Feb 10 - 16 is an ongoing sale right now. You can shop wet n wild cosmetics with a BOGO 50% off deal. Essie nail polish is available with the limited edition. $10 ExtraBucks rewards when you buy 2 Physicians Formula cosmetics. Get a 30% discount on photo cards, photo panels. 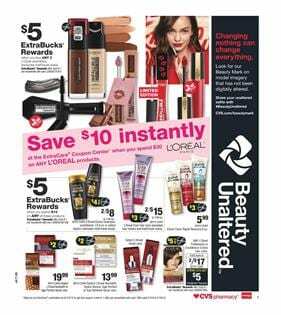 Another great deal by CVS is that you save 10% via ExtraCare coupon center when you spend $30 on any L'Oreal products. See more ExtraBucks rewards on skin care and hair products that are viewable on pg 8. Cetaphil, Aquaphor, Simple facial care, Aveeno and Neutrogena products are either BOGO deals or giving you extrabucks for a certain amount of purchase. More ExtraBucks rewards can be your profits out of shopping for Amiactin or Palmer's skin care, Nivea body lotion etc. Visit pg 10 for all the details of these products.